There is a social virtual world where people go to spend time with friends, meet new ones, and have fun in a beautiful 3D environment. Avast, me hearties! Saturday, September 19th is National Talk Like A Pirate Day. The cannons be blastin’ as th’ filthiest holiday of the year kicks off a week of debaucherous celebration in There for Pirate Daze. Calling all ye wenches, scallywags and landlubbers to join in the celebratin’! Pirate Daze in There starts Friday, September 18th and the party will go until we set sail for the high seas again the following weekend. We’re hankerin’ for a good ole time, and we know how t’ give it too, check out all of the Pirate Daze events planned for you! Description: Are you a Pirate? Think you can make it to the treasure map for a great prize? RumRunners Isle will be giving a buggy as a prize. This is an ongoing Quest during Pirate Week so check the location for additional scheduled events. Description: A purported Spanish Pirate, the “last of the Buccaneers, “who is claimed to have raided the west coast of Florida during the late 18th and early 19th centuries. Sponsored by RumRunner’s Isle. Description: Ahoy there all ye wenches and seadogs! Come dressed in yer best piratey outfit, and be ready to answer some questions in the zone box for points! Arrrr dress and talk like a pirate! Description: Gangplank’s raid has pitted his crew against each other. Wenches and seadogs will compete in a capture the bacio event. The winner qualifies to take the prize. Pirate Week! 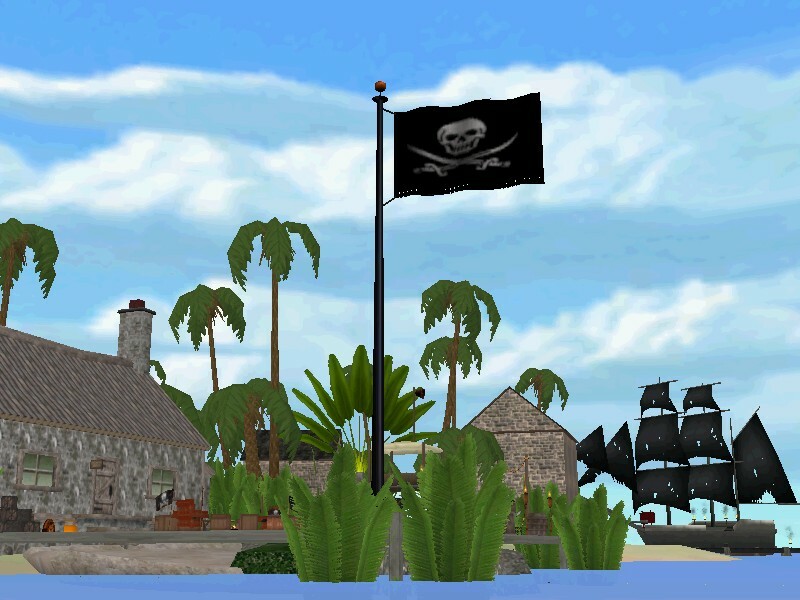 Description: Rescue the missing pirate crew and be entered for a chance to win an awesome prize! 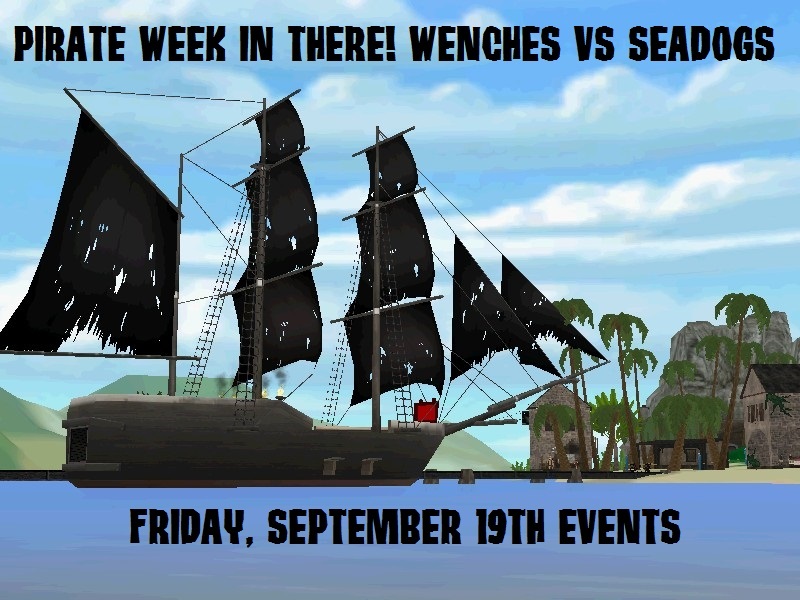 This is an event for pirate week wenches vs seadogs! Description: A purported Spanish Pirate, the “last of the Buccaneers,”who is claimed to have raided the west coast of Florida during the late 18th and early 19th centuries. Sponsored by RumRunner’s Isle. Description: Grab ye parrots n hooks n get ready to party!! !Scurvy pirate music for ye everyday band o’pirates! Dancing made to match the music! 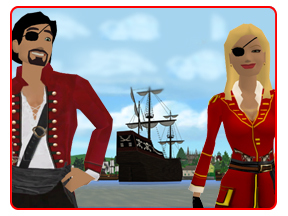 Description: Dress up in your best pirate outfit and get ready for a piratey ridge ride! Description: Gangplank is seeking marauders to raid Aurora. Only the best spades players can plunder. Wenches and seadogs invited. Winners qualify to take the prize. Pirate Week! Avast ye scallywags! Grand adventuaaaarrrrs await matey in ye ol’ Virtual World There during Pirate Week. Hoist ye colors for Wenches or Seadogs and show yer allegience to yer crew. Description: Pirate quest sponsored by sidvicious2008 first prize 10k, second prize 5k dice roll when quest is over. Description: Ahoy matey! Come play golf with the pirates or volunteer to be a ball. Ye shall drink rum and golf away! Arghhh! 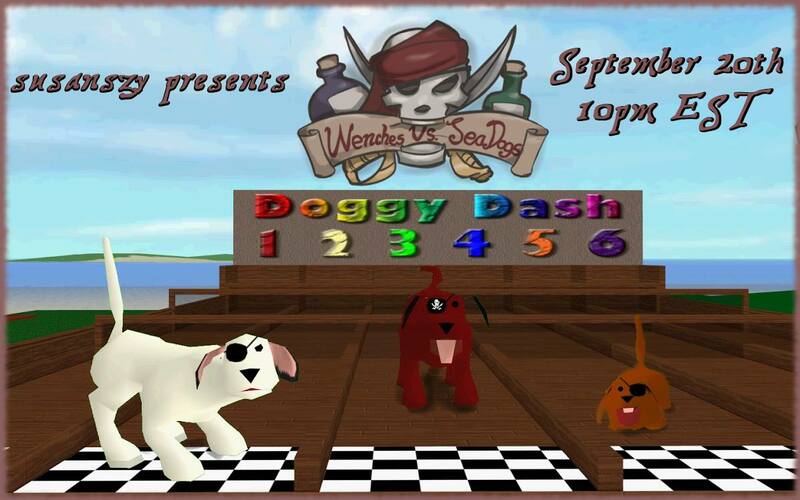 Description: Who has the fastest dogs, wenches or seadogs? Bring your puppy to this PIRATE dog race and let’s find out! Description: Burping, lemerick, dance, song welcome. Which pirate will walk the plank and which will get the booty? Guidelines at event. Description: Miss Fortune’s crew has committed mutiny. Wenches and seadogs fight in a capture the point paintball event. Winner qualifies to take the prize. Pirate Week! Weigh anchor, hoist the mizzen and batten down the hatches as we set sail for endless adventure in There during Pirate Week. Plenty o’ sword fightin’, plank walkin’ and plundern’ to be had! Shiver me timbers! Description: Are you a Pirate? Think you can make it to the treasure map for a great prize? RumRunners Isle will be giving a buggy away as a prize. Description: Grab ye parrots n hooks n get ready to party!!! Scurvy pirate music for ye everyday band o’pirates! Dancing made to match the music! 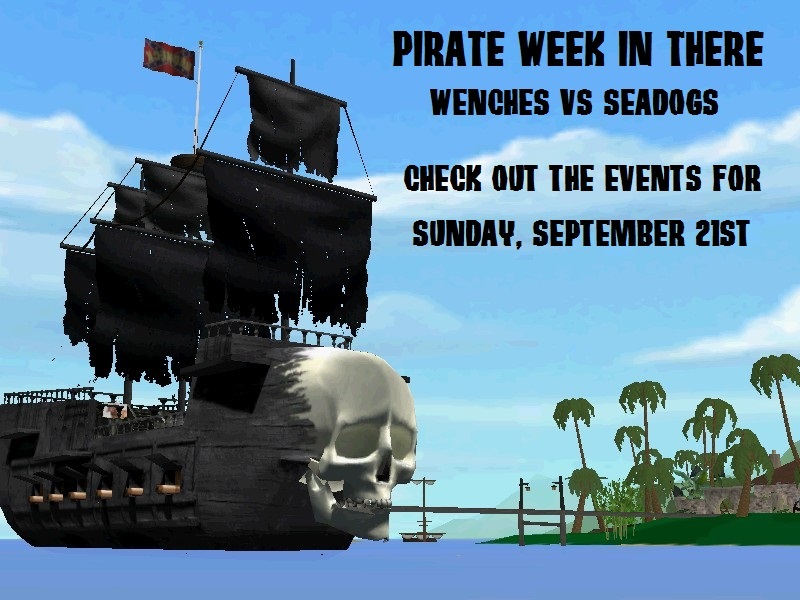 Description: Who will win, SeaDogs, or wenches? Arrgh! I’m bettin’ a pirate! Choose a side and try a race. Have some B-I-N-G-O fun while you are hanging out! Sponsored by RumRunner. Description: Join us for the CCR dice roll at Rumrunners! Which pirate will win? Description: Miss Fortune is seeking scallywags for her new crew. Only the best hearts player can step foot onto ship. Wenches and seadogs are invited. Winner qualifies to take the prize. Pirate Week!